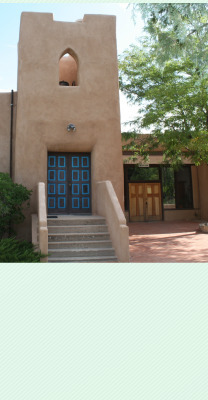 "Las Placitas Presbyterian Church (LPPC) is an inclusive Christian community gathering for worship, prayer, learning, fellowship and spiritual growth for people of all ages. As members of the Body of Christ, we celebrate God's grace in our lives and seek to extend God's love and promise through service, outreach, education, music, arts and witness. We are committed to peace and justice in the world, and to care for the earth as God's gift to humankind. We cherish our origin as an early Spanish village church and honor this heritage in all our activities. We are Presbyterian in theology and governance, but welcome and support all people as they explore their personal life paths, emphasizing Christ's word, 'Where two or three are gathered in my name, I am there among them.' — Matthew 18:20"